China has long since aggregated the means and materials of production, but increasingly it’s seeking to lay claim to the creative origins of products—the design. 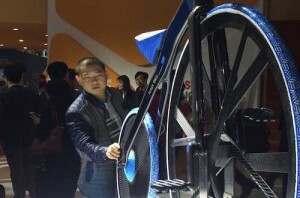 For the second show running, global materials and additive supplier BASF teamed with show organizer Adsale to feature the BASF Design Innovation pavilion as an official concurrent event during Chinaplas 2016 held this April in Shanghai. According to China’s CCTV, the country boasts more than 1000 design colleges generating 600,000 design graduates annually, with these grads filling design roles at Chinese and multinational OEMs. Will they source plastics in new designs? Located at one of the primary entrances to the show grounds, the program covered three main themes—travel light, live cool and play safe—with five different forums and a chance to “meet the designer”, including well-known industrial designers Chris Lefteri of LKK and Yang Wenqing of LOE Design. Closing the design loop, major OEMs including Haier, Lenovo and Volkswagen also took part. Kothrade said a goal of the pavilion and an area of emphasis for BASF going forward is to help establish China as a global creative power. He noted that BASF is investing in China in line with its own growth, recently expanding its innovation complex in Shanghai and launching a design competition that address challenges of urban living. Supporting associations include cida (Chinese Industrial Design Association) and the Ningbo Industrial Design Union. At the show’s opening press conference, Adsale Chairman Stanley Chu referenced China’s 5th-year plan and how it calls for the country’s industry to utilize “advanced materials” and transition from being a low-cost-labor country. Andy Postlethwaite, BASF’s senior VP engineering plastics Asia Pacific, has also seen the rise of design in the region. “In the recent past, there has been a much stronger design presence in China,” Postlethwaite told Plastics Technology. “That shows a maturing of the industry.” In particular, Postlethwaite noted that BASF works with Chinese OEMs to educate them on plastics’ potential. At Chinaplas, BASF highlighted numerous applications applying plastics where they traditionally aren’t used to help Chinese clients understand the potential for the material. Among these, an auxiliary window form, usually fabricated in steel, utilized a pultruded polyurethane. In the construction phase, this form is used for the window mount, with the PUR version offering one-quarter the weight and improved thermal performance. Elsewhere on the stand, BASF showcased a composite utility pole. Postlethwaite noted that in disaster-prone or difficult-to-reach areas these light-weight poles are easier to transport, install and maintain. A recent installation survived a typhoon in Guangdong while steel and concrete poles failed. In both these cases, BASF partnered with a Chinese company for the product design and manufacture. In China and elsewhere, the challenge for Randy Beavers, regional business director Asia Pacific for Eastman Chemical, is helping familiarize processors, designers and OEMs with the company’s Tritan copolyester resin. Beavers noted at Chinaplas that more than 98% of companies working with Tritan are totally new to Eastman, with a majority of time spent not with buying customers but with brandowners in the design phase. To offer technical support to area molders, a little over one year ago, the company opened a lab in Shanghai to offer molding trials and simulations, with design engineers on hand to provide material recommendations, mold and part reviews, and design recommendations, including nitty gritty aspects like draft angles, wall thicknesses and mold pressures and temperatures. If China does indeed become a global creative power, Eastman, BASF and other material companies are actively working to ensure Chinese designs call for plastics.